Penguins – Spy in the Huddle | John Downer Productions Ltd.
With their feisty nature, penguins are bringing up their young against the most extraordinary odds. Penguins – Spy in the Huddle spends nearly a year in their close company, deploying 50 spycams to capture as never before the true character of three very different, yet equally charismatic, birds. ­This is what it’s really like to be a penguin. From the freezing ice to the scorching desert, the team that brought you the award-winning Polar Bear – Spy on the Ice now reveals the intimate behaviour of nature’s most devoted parents – from emperor penguins in Antarctica, rockhopper penguins on the Falkland Islands and Humboldt penguins in the Atacama Desert of Peru. 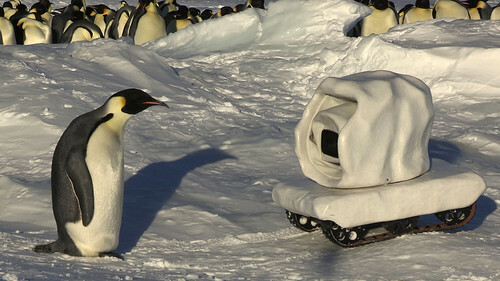 Key to the success of the spycam missions are the animatronic cameras cleverly disguised as lifesize penguins which can silently infiltrate the colonies to record the penguins’ often emotional, and sometimes amusing, behaviour. They’re on hand to chart the tough challenges these penguins face from the moment they emerge from the sea to raising their chicks and finally returning to the water. Penguins – Spy in the Huddle takes you closer to penguins than ever before. Filmed for the first time the moment an emperor penguin lays her egg. Rockhopper Penguins scale the steep cliffs of the Falkland Islands. For the series, 1,000 hours of intimate behaviour were recorded – almost nothing that happened on the colony was missed. With emperor penguins, ­this proved to be the longest continuous shoot of emperors ever made – more than 330 consecutive days. The overwintering crew was totally isolated for 8 months, with no contact with the outside world beyond a satellite uplink, in temperatures as low as -60ºC. There were only 10 days when they didn’t film. Humboldt penguins are shy birds and have hardly ever been filmed. Spycams played a key role in the 165 days of filming. Full-size penguincams are a totally revolutionary concept – they walk, get back up when knocked over, have cameras in their eyes and can even lay their own eggcams. 50 spycams were deployed in all – a record for any John Downer Production. 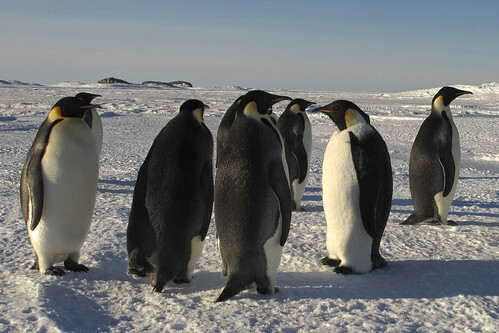 Emperor Penguins – 17 spycameras in all: 1 penguincam, 1 emperorcam, 1 chickcam, 8 eggcams, 2 moving snowcams, 4 static snowcams. Rockhopper Penguins – 18 spycameras in all: 1 walking penguin-cam, 3 static penguincams, 8 eggcams, 1 rockcam, 1 underwater penguincam, 3 static rockcams, 1 underwater rockcam. Humboldt Penguins – 16 spycams in all: 1 underwater penguincam, 1 walking penguincam, 3 static penguincams. 8 eggcams, 3 static spycams. Penguincam beaten up by a rockhopper and has its head taken off (shown in final programme). Penguincam also had legs broken twice when knocked of cliff by rockhoppers. Flipper ripped off by an albatross. Penguincam washed away, but delivered back by the waves. Underwater penguincam attacked by sealions – took off another flipper. Rockhopper courting penguincam, and jealous mate beating it up. Caracara birds taking their own aerials of the colony by picking up an eggcam and flying with it as it still films. Rockhoppers taking a ride on rockcam. Also rockcam helping the rockhoppers return to the sea. Emperor penguins cross a treacherous frozen sea to reach their breeding grounds, on the way one becomes lost in a blizzard. Once there, the females hilariously flipper flight over the males and those that succeed “waddle walk” with their partners. They must lay their eggs without touching the ice but it’s the males that face the greatest challenge – overwintering alone in the coldest place on earth. 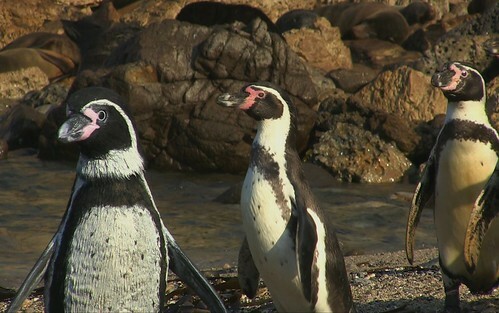 Humboldts are a strange tropical penguin that has rarely been filmed. To reach their desert nests they negotiate 20,000 predatory sea lions, dodge vampire bats and battle half a million sharp-beaked seabirds. The hard work for all the penguins finally pays off when their tiny, vulnerable chicks begin to hatch. Among the spycameras capturing unique behaviour is a technological first – robotic penguins with cameras for eyes. Watched by spycams, chicks are hatching out all over. Male emperors form an identity parade before handing over their newborns to the returning females. The mothers shuffle into a huddle to protect their offspring from a blizzard. Outside, one tiny chick doesn’t make it and lies frozen by his mother. Chickcam films the young ones walking on their mothers’ feet and taking their own first unsteady steps. Females without young try to kidnap the new arrivals and giant petrels force the chicks to huddle for protection. 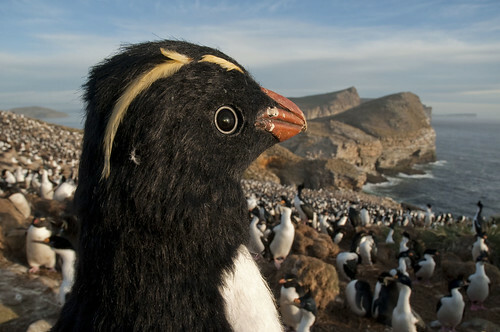 On the Falklands, rockhopper chicks meet some unruly neighbours – king cormorants. Predatory vultures are seen off by a penguin army. Caracara birds grab an eggcam and film the aerial shots of the colony! Parents take a rock shower and even ‘chimney climb’ to their own private spa. The chicks face more predators and bereaved parents plan a chicknap. In Peru, Humboldt chicks emerge into the desert. The adults leave their burrow plastered in mud and needing a bath. They’re joined in the waves by Humboltcam and boisterous fur seals. Home alone, the chicks shoot gulls with projectile poo and the colony faces a huge cormorant invasion. The chicks are learning to become adult penguins. The chicks are growing up fast and becoming increasingly independent. Emperor and rockhopper chicks are placed in a crèche as their parents go fishing. The Humboldts are left in their burrows, as the adults enjoy a soft landing of feathers by a beach swarming with cormorants. Packed in a huddle, the emperor chicks have to be identity checked before they are fed and their parents are swamped by hungry imposters. Giant petrels are an ever-present danger while vampire bats target the Humboldts. As the young grow bigger and preen out baby fluff they sport punk hairdos. The emperor chicks go skating on a newly formed ice rink while the rockhopper chicks practice jumping skills. Eventually all the chicks leave for the sea, tackling the same hazards as their parents before them, from sea lions to predatory birds, high cliffs to glaciers. All face huge challenges. There are plenty of surprises along the way, but soon the chicks discover their true home – the sea. 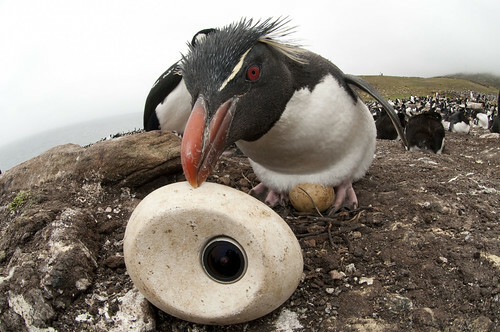 From egg to adolescent, spycams have been with the young penguins through their tough early months. They are with them as they leave. It will be years before they follow in their parents’ footsteps and return to breed. Behind the Scenes - The Spy Cameras ! This spycamera uses the latest robot technology to produce a bipedal penguin with 20 degrees of freedom of movement. Rockerhoppercam contains gyro/accelerometer sensors and a high-resolution vision system to allow it to walk among the penguins. This amazing robot penguin can waddle over different terrains and even pull itself up autonomously after it has fallen over. Its penguin brain can be loaded with over 75 preprogrammed penguin motions. It was so realistic that some penguins accepted it as one of their own. Standing at one metre high, Emperorcam filmed eye to eye with the Emperors. Its fully articulated head tracked the movements of penguins in the colony. For low angle details of penguin life, Emperorcam laid Eggcams. To capture life on the move, a tobogganing Emperorcam was deployed for sea ice operations. With no visible moving parts it could slide over the ice and keep up with the travelling emperors. Cameras in the body and eye captured their adventures to and from the sea. It could even float on open water and film the chicks first arrival to the sea. Another robotic penguin with the technology to mimic the behaviour of the Humboldt penguin. 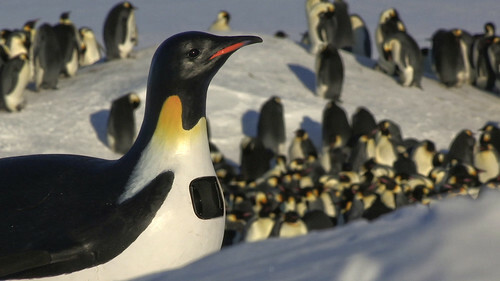 This was the most effective Spycamera for getting close to the most nervous of all penguins. Essential for following the lives of chicks and life in the huddle. It’s fluffy exterior provided good insulation against the cold preventing the cameras from freezing up. This heavy duty Spycamera was developed to operate in the worst possible Antarctic conditions. Its silent operation at slow speeds enabled Snowcam to film close to the penguins without ruffling a feather. All terrain tracks and state of the art batteries made it operational during the coldest days of the Antarctic winter. 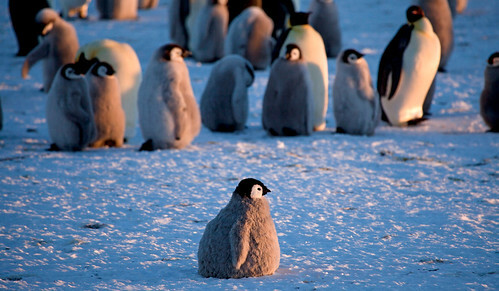 Designed to mimic life size penguin eggs, but ruggedized to resist cracking from extreme weather and immense impacts. Inside the super tough shell is a HD remote camera capable of recording for up to 12 hours. 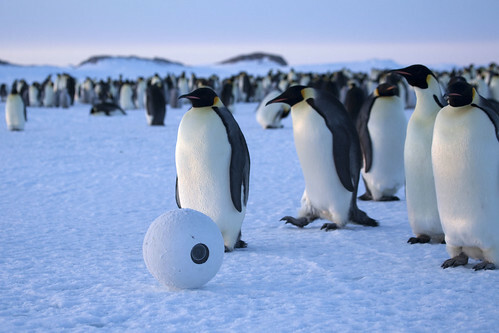 Pulled out of retirement from Polar Bears –Spy On The Ice, Snowballcam fitted in perfectly in to the Antarctic environment. With no visible moving parts it was able to roll across most terrains, even up hill. It could also film on the roll thanks to a self-leveling high definition camera. Its quiet operation made it an important device for filming close to the colony. Remote operated with a top swimming speed of 4 knots and capable of diving down to 100 metres. 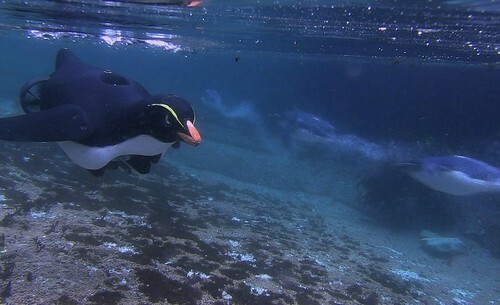 Cameras hidden in the eye captured penguin behaviour above and below water. Its penguin disguise was perfect for swimming alongside penguins, even in rough seas.